There is still time to register for our Annual Labor & Employment Law Seminar but hurry, time is running out and seating is limited! This year, as a thank you for attending our seminar, attendees will have a chance at winning an iPad mini or a $100 gift card to Mancy’s. 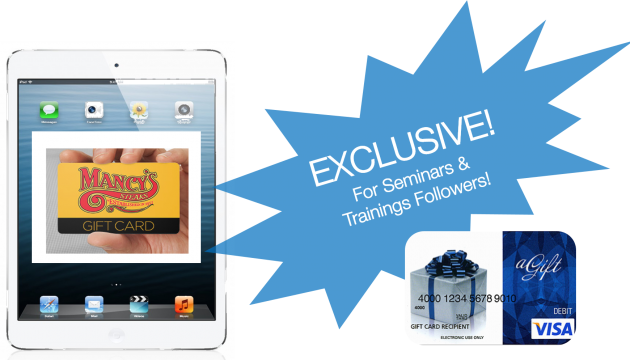 Followers of our LinkedIn Seminars & Trainings page who attend the seminar will not only have instant access to all of our seminar information, webinar details, and training videos, they will also exclusively have a chance to win a $25 gift Visa gift card. Register for the October 1, 2015 seminar and follow our LinkedIn Seminars & Trainings page for full details and a chance at all 3 prizes!